In early 2019 trading, it looked as though we were set to resume the ‘sell at any price’ trend. However, US markets managed to turn that around, but lets discuss that further down this report. Volumes were light in Asia, which is often the case when a major indices has a national holiday (Japan). Scarily, the ASX saw another heavy session as financials looked to continue pushing values weaker. Both the Australian All Ord’s and the currency opened 2019 on a less than impressive note. The index closed the day off 1.6% (financials again leading), but equally concerning, was the -0.8% decline in the A$ now trading with a 69 handle. The trigger today was the China Factory Activity, as it released way below consensus and encouraged a 3% in the Hang Seng and a 1.2% fall for Shanghai. INR has also joined the sell-off and it lost 0.9% against the US Dollar. Europe was quick to follow the Asian bear move and both influenced early US futures trading. More weak economic data contributed to the decline with the Eurozone PMI printing below the 50 handle (above 50 signifies expansion). News that the ECB had taken control of the Italian Banka Carige – after the board resigned, hit other Italian bank stocks as well as the FTSE MIB -1.2%. CAC (-0.9%) and DAX (+0.2%) mixed today, but are uncertain as the bear sentiment looked to have returned for the new year. BREXIT is still pushing fear and uncertainty around the markets, which is probably no surprise the FTSE is off % and Sterling down 1.2%. Into the European close, a healthy bounce seen in US markets helped a small bounce and the late decline in the Euro. US cash indices were expected lower and that is what we saw. The DOW traded 400 points lower in the first few minutes of trading, but fortunately was not to stay there! 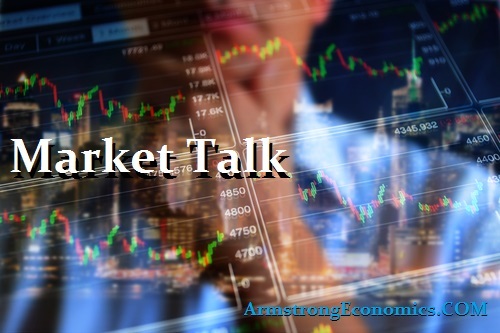 Talk of progress being made in US/China trade negotiations (which includes the Presidents Tweets), sentiment that the sell-off is dragging a little too long, a flatter yield curve and an encouraging demand for US Dollars are all helping change the markets mood. The 400 point decline was soon to see a positive print as volumes increase, talk of a friendly employment report (due Friday) and a build-up of positive rhetoric coming from the FED Friday. Capital flow remains US bound and that is being displayed quite strongly in the currency with the DXY rallying 1% today to take it back close to a 98 handle. The final minutes of trading we saw core indices back into the red, but way off of the days lows then only to recover to finish higher. This is what we can expect for the first six weeks of 2019 trading. NASDAQ did manage to hold onto positive numbers best, but had already taken its share of the declines late last year. Oil had a similar trading pattern today after news that production did slow in December. President Trump commented that he understands he influenced the recent price decline in oil by releasing supplies to aid business. US government enters day 12 of its shutdown.